The Montecristo Petit Tubos is an accessible and delicious Mareva, of 42 ring gauge, 5.1” (129mm) long and comes in a box of 25 cigars in aluminum tubes. While sharing the same dimensions as the Montecristo No.4, it remains somewhat different, a little bit more elegant and with its own flavor profile. Its perfect construction and its medium body let the aficionado enjoy the beautiful flavors of earth, coffee, cream, leather, and some herbal freshness. 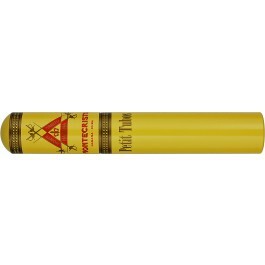 This cigar is a great pick for a quick smoke on the go, or for a first Cuban experience.